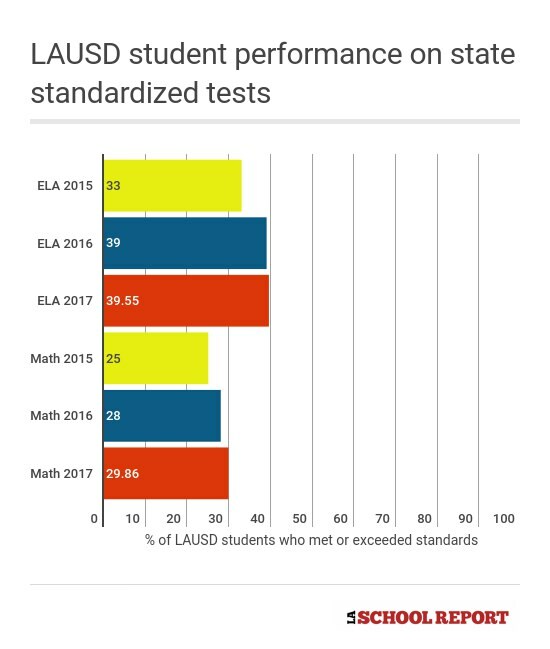 LA Unified’s scores on state standardized tests continue to fall below the state average, even though its students posted slightly better gains, according to results released Wednesday. But English learners made no improvement. Their near-stagnant scores last year had caused deep consternation in the district, with one board member saying “the data is miserable.” The one ethnic group that showed the most improvement was African-Americans, but their scores still trailed all other groups. To look up scores at your child’s school, click here and enter the county, district, and school from the drop-down menus. You can then choose the year and any subgroups you want to look at like English learners or by ethnicity or gender. LA Unified continues to make better progress than the state, but progress has slowed down from last year when students made a 6 percentage point improvement in English from the year before and a 4 percentage point increase in math. The results do not include the district’s independent charter schools. A California Charter Schools Association spokesman said they were still analyzing data. LA Unified officials said this year the district is focused on accelerating growth. School board President Mónica García said the test scores are one of multiple measures the district uses to move toward its goal of 100 percent graduation, and they help teachers accelerate support interventions for individual students. Garcia said her biggest interest is finding out which schools are closing achievement gaps and how that can spread to the entire district. Seth Litt, executive director of the LA-based parent advocacy organization Parent Revolution, said the results raised questions. “If grad rates are reaching historic highs in LAUSD but student proficiency is pretty flat, it raises the question of how prepared those students are for college,” Litt said. He said he also wants to examine which schools are closing achievement gaps and which aren’t, since his parent members typically come from the district’s underserved communities. He also wants to know how the district will learn from which improvement strategies have worked. “I think in terms of some of the highlights, we’re glad that there’s growth across ELA and math for most grade levels,” said Derrick Chau, the district’s senior executive director of P-12 Education in the Division of Instruction, pointing to improvements for African-American and Latino students. “In some ways we are closing the gap, but we certainly are working toward accelerating that,” he said. He also said the district saw more growth than other urban school districts. In math, only San Bernardino and Long Beach improved at a faster rate than LA Unified compared to last year. Among the 12 urban districts, LA Unified ranked seventh in its percentage of students who were proficient in math, according to a district analysis. In English, LA Unified ranks sixth among the 12 urban districts when it comes to students who were proficient, according to the analysis. This school year, the district is implementing new English language arts curriculum in elementary and high schools that is aligned to the new Common Core standards, Chau said, which officials hope will improve those results. Middle schools already have the new curriculum, and new math curriculum has already been implemented district-wide. “We’re hopeful as we continue to see growth and accelerate this growth moving forward that future high school students will be better prepared and more successful in graduation and A-G,” Chau said, referring to a set of coursework required for admission to the state’s public university systems. This is the third year that students have taken the tests, which cover English language arts and math and assess whether students are prepared for college. The tests are aligned to the Common Core standards and are officially called California Assessment for Student Performance and Progress, though they are better known as Smarter Balanced tests. Students in grades 3 through 8 and 11th grade took the tests online in May. Statewide, 3.2 million students took the test and nearly 261,000 of those students were in LA Unified, the state’s largest district. 29.53 percent of African-American students were proficient in English, and 18.91 percent were proficient in math. 33.66 percent of Latinos were proficient in English, and 23.56 percent were proficient in math. Results improved about one percentage point in each subject compared to last year. White students’ scores remained stagnant, with 66.13 percent of students proficient in English and 57.28 percent proficient in math. Asian students received the highest scores, as in previous years, with 73.46 percent proficient in English, a slight decrease from last year, and 70.29 percent proficient in math. English learners made no improvement on their scores in English and math. Results for students who have a disability also remained stagnant. Overall, students made gains in English in every grade level except fifth grade. Students in seventh grade made the biggest gains. Students in all grades made gains in math, except in 11th grade. The district sent individual student scores to parents beginning in August through early September, which show year over year progress for students and how students fared on different areas of the test. Oscar Lafarga, executive director of the district’s Office of Data and Accountability, encouraged parents to examine that report and if a child has declined to contact their child’s teacher. “A parent is invited to use that report to sit with the teacher and to talk about what it is they can be doing to support (the child) of course at home, but more importantly what a teacher is doing to fit their child’s needs in the classroom,” Lafarga said. Students are considered proficient if they met or exceeded the standard. The other categories are standard nearly met and standard not met. The tests are not traditional multiple choice tests. Questions were designed to show how well students could write, analyze, and solve real-world problems. The test also adapts to students’ answers so a correct answer on one question would produce a more challenging question while a wrong answer led to an easier question. The release of the statewide results had been delayed since the end of August, after it was discovered there were errors in the data the department received from its test contractor. *UPDATED This story has been updated to include a statement from school board member Kelly Gonez.